Tucked away in a garden overlooking the Cape Henry bike trail this simple yet elegant lady enjoys a peaceful existence in a cute neighborhood near the beach. This mysterious maiden is tucked away near the FBI building at Virginia Eye Associates. She is really spectacular- a favorite of the day! Her highness is a rare concrete mermaid but she carries her weight well. Her tail is inset with a tile mosaic and she dons several types of sea shells. 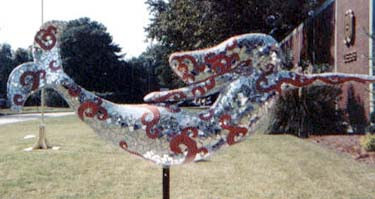 She is also the only mermaid in Sandbridge surrounded by more than a dozen Promise Dolphins. This cutie was commissioned by Max & Erma's near Towne Center and proudly hangs in the dining room wearing the company uniform and several adorable cartoons. Just back from a makeover, Norfolk was not even back on her stand yet when we went to see her at Bell Auto Sales. That didn't keep her friendly caretakers from showing her off for us though. The students of Northside Middle School did the decorating of this colorful maiden as a recycling project. Her mosaic is made from bottle caps. Inlaid into the intricately placed mirror mosaic of this sparkling lady are small wooden hands. Appropriate to her home at the Hilltop Medical Center. One of the many very friendly folks with Blue Heron Realty welcomed me to view her standing in the back office. I envy the lucky one who gets to sit at the desk under the reach of this shell and mirror infused lavender lass. This "lazy" lady has suffered damage from a broken stand. In spite of the large crack on her torso, she is still majestic enough to impress. She is awaiting repair and I will update my information once she is again in public. 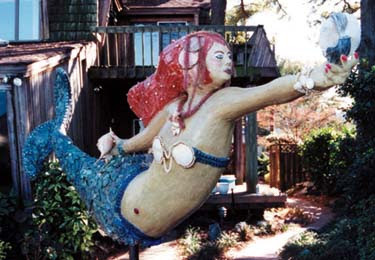 The Palace Theater is home to this currently (and temporarily) downtrodden mermaid. She is slated to get a much needed makeover in the very near future. Even though she is severely weather worn, it is easy to appreciate how spectacular she once was. We caught her on May 02, 2009. This stately beauty stands in the 1800 block of Oceanview Ave. Her deep bronze complexion has high lights in a pale turquoise to accentuate her features. Chris Alexander outdid herself... again! This cutie is in the front window of the Kingston School. Her top is a beautifully painted horizon... her tail, decorated by the children who attend there. This technicolor fresco mermaid stands at the heart of the very appropriate Prism Plaza near Mount Trashmore. This vibrant vixen's digs include an indoor garden and glass ceiling. Decorated with an impressive array of grocery list items, this brilliant mermaid welcomes all who enter the business offices of Farm Fresh in Chimney Hill Shopping Center. This beautiful girl finally found a safe place to live out the rest of her days at Lake Taylor Hospital after she was horribly mistreated by hateful vandals. Painstakingly mended by Chris Alexander, her scars are barely noticeable. We caught her on May 01, 2009. Norfolk Academy plays host to this lovely lady. Formerly in front of the school's book store, she now has a wonderful vantage point of the Lower School's atrium. Her s cales were inscribed by the students of the school with their initials and their graduation date and then lovingly applied by artist Georgia Mason. The bottom photo is from the Norfolk website just to give you an idea of what she looks like close up. Only viewable from the Larchmont Bridge on Hampton Blvd. this lovely lady seems to rise from a bush in the yard of her owner. The 2nd photo is from the Norfolk website just to give you an idea of what she looks like close up. This unfortunate lady was badly damaged by vandals who removed her from her post at William E. Wood Realty and threw her into the traffic on Hampton Blvd. She privately awaits repair and redesign by artist Chris Alexander. At her unveiling she will be dedicated in loving memory of deeply missed co-worker Debbie Myers. I have no connection or affiliation with the City of Norfolk. I do not have any affiliation with the artists or the campaign promoting them. 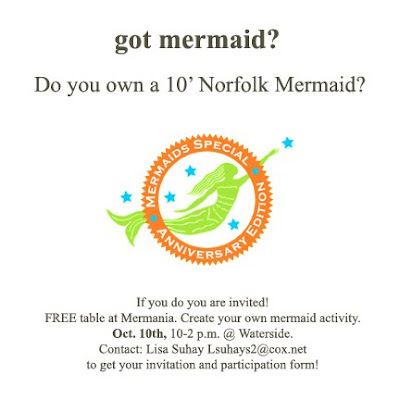 I am simply a fan of the Norfolk Mermaids on Parade. My opinions are my own and do not reflect the feelings or opinions of the City of Norfolk or the artists of the Mermaids. No Mermaids were harmed during my hunts. I tag and release. My photos are my trophy.